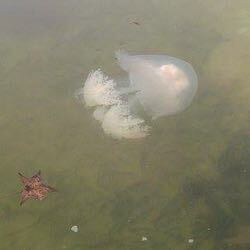 The mushroom cap jellyfish is an uncommon visitor into lower Chesapeake Bay during the fall and early winter. The sting is mild, if felt at all. Like the cannonball jellyfish, the mushroom cap jelly has a firm and dense swimming bell, although its bell tends to be flatter. The bell lacks tentacles around its outside rim, but it does have thick oral arms that extend down from the center. An adult can have a bell to up to 20 inches in diameter. The bell may be creamy white to light yellow, brown, blue, pink or gree. The oral arms may have brown or yellowish markings.